This essay was originally published at Trellia’s Mirror Book. Not too long ago, this picture of a dress caused an internet storm. Some people (like me) see the dress as blue and black; others swear it is white and gold. * Some people are even capable of seeing it as both, or as different colours entirely. To my knowledge, it’s the very first time that a photograph has caused such a bizarre phenomenon. A lot of people have criticised the fascination surrounding The Dress as yet another silly internet fad, eclipsing the “real” important news of the day. I actually think that dismissing this phenomenon is, if you excuse the pun, rather short-sighted. For perhaps the first time in history, this photo demonstrates that the gulf between people’s visual perception is a lot wider than we first thought, and potentially opens up a new line of study in the science behind vision (it also gets the general public interested in this science, which is always a good thing). Lots of hypotheses have been put forward as to why there’s such a split between the world population on the perception of the dress (some experts think it is entirely due to the brain’s interpretation of the picture, while others think it is due to the variation in number of rods and cones individuals have in their eyes), but none of these have been 100% proved or disproved. I think that’s rather exciting. I also think The Dress serves as a very useful metaphor for exploring spirituality and religion, and what religious belief can mean. It turns out that the dress photographed is blue and black. But that still doesn’t change the fact that so many people, in fact the majority of people, see it as white and gold – even though they now know that it is really blue and black! So even though the dress itself is really blue and black, what does that make the photograph? Are the majority of people who see the dress as white and gold incorrect? This paradox is very similar to how I perceive spirituality. I think reality itself can be considered on two levels. On one level, there is the reality that “actually” exists, the world governed by physics and maths. This is like the blue and black dress, i.e. the real nature of the dress. But on another level, there is reality as we perceive it. Because humans perceive things through our senses which are interpreted by our brains, our reality is always subjective. It is in fact impossible for us to see the “real” reality because we are at the mercy of our own sensory organs, which are not perfect, and our brain, which is easily confused and fooled and has so much emotion and psychology going on that it’s always distorting the “reality” we see. This is like the white and gold dress that the majority of people perceive in the photo – the reality that we ourselves experience, despite what the actual reality might be. So “reality” can be defined as either that which really exists but we do not truly perceive, and that which does not really exist but we do perceive. And that’s where I think spirituality and religion comes in – the world of gods, spirits and magic. One may argue that these things only exist in our imagination, in our minds – but because we perceive the whole of reality in our minds, does this make them any less real? This is also why I feel I can hold contradictory ideas about spirituality in my head. On the one hand, I am something of a Humanistic Pagan; I believe that nature is worth worshipping simply for its own sake, and that it doesn’t require the existence of deities or magic in order for us to respect and venerate it. But I am also a Theistic Pagan – I worship deities because I feel “right” in doing so, and I do feel something of a conscious, “spiritual” presence when in nature at times. I do not know exactly what I feel or believe, but I also realise that it doesn’t matter – just as it doesn’t really matter whether you perceive that dress as blue and black, or white and gold. Although it doesn’t seem to make sense, in a way, it’s both. Although I’ve been interested in Paganism for many, many years, I have only recently started practising Paganism on a regular basis. As suggested in Scott Cunningham’s Wicca: A Guide for the Solitary Practitioner, I’ve decided to start a “Mirror Book;” a journal of my progress and thoughts in discovering my own spiritual path. You can read this progress online at The Mirror Book. I would definitely describe myself as an Eclectic Pagan, borrowing from many different traditions, but I have a particular fascination with Shinto, the “indigenous” Japanese religion. This is partly because of my own background – I studied Japanese at university, lived in Japan for several years and currently work for a Japanese non-profit. 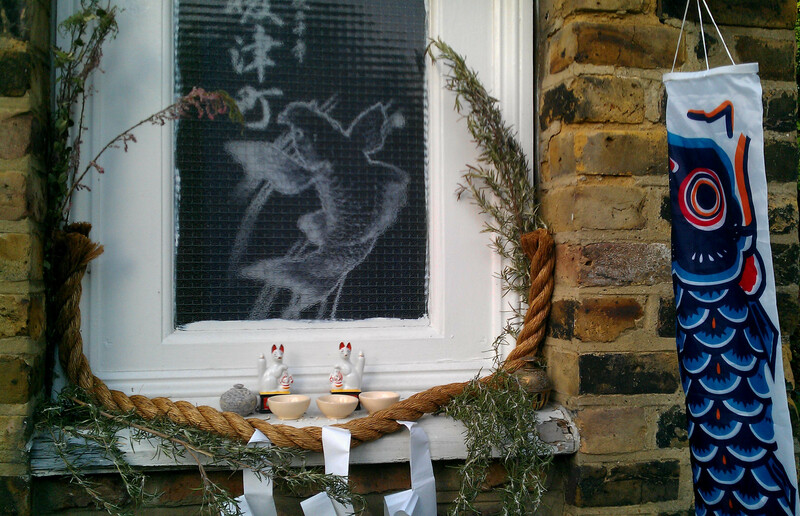 It’s also partly because, as there is a thriving family of foxes living very near my house, I venerate Inari, a Japanese deity closely associated with foxes, as a patron deity; I have a shrine to Inari in my courtyard. I’m also more than a little interested in the Gothic subculture; you can view my “Gothic Stereotypes” art here. I’m in Humanistic Paganism again!